Memorial Day is almost here, and its what many consider the unofficial start of summer. With great weather, food and company, what else could you ask for during a long weekend? If you’re having a gathering this Memorial Day weekend such as a picnic or barbecue, consider adding some sweets to the mix! After everyone has had their share of hamburgers and hot dogs, its likely that many will be in the mood for something sweet. 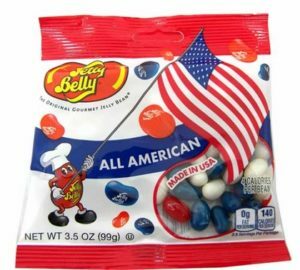 Classics like M&M’s and Jelly Belly jelly beans are available in red, white and blue for your buffet table. Or, use them to top off cookies or cupcakes. Lollipops in patriotic colors are great for the kids, too. Hershey kisses available in red and blue foil wrappers make for some fun and yummy decor when scattered throughout the food tables! Shop more patriotic candy so you receive it just in time for Memorial Day! There’s nothing quite like heading to the concession stand during a break in the game to purchasing a mouthwatering hot dog, salty roasted sunflower seeds, or an ice cold snow cone. 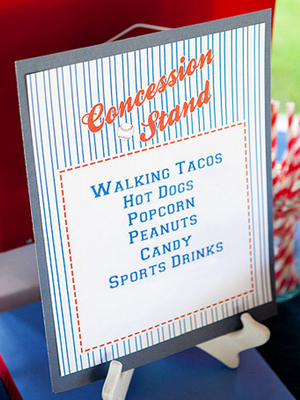 Not only do concession stand treats satisfy your hunger, but there’s just something so classic about munching on these very tasty foods during a perfect summer game! Gummy candies, such as peach rings, Swedish Fish, and Sour Patch Kids hold well in the heat, providing sour and sweet notes that every patron is craving. Need something chewy? Big League Chew bubble gum is essential at the ballpark, and is sure to please both children and adults alike! When it comes to a sunny day spend in the stadium of your local ballpark, frozen treats are a necessity! Ice cream cones and cups, complete with a variety of toppings, are always a crown favorite. Snow cones, drizzled with fruity syrups, are a favorite of little baseball fans of all ages.